Parentzone Scotland brings together the contents of the previous Parentzone and Scottish Schools Online websites to form a single resource. In the Find a school section, you will find all the schools information previously held on Scottish Schools Online – contact details for every primary, secondary and special school in Scotland, as well as information on school awards and links to school websites. This section also now includes information on performance of leavers from S4-S6 for each secondary school in Scotland. enhanced support for parents of children with additional support needs. This is an exciting new project run by our Educational Psychologists. It’s a fantastic leadership opportunity for staff to develop a run a school based project in health and wellbeing, not only benefiting the schools and the pupils but also developing personal project management skills. Congratulations to the winners of the May 2010 Walk to School Week campaign. The Hands–Up survey results submitted revealed that the number of cars on the ‘school run’ that week for these schools were considerably reduced and were the most improved compared to previous WTSW surveys. Well done! As in previous years each winning school will receive their prize of £50 at the Junior Road Safety Officers Induction event on the 24th September, at Port Seton Community Centre organised by the Road Safety Officers of Lothian & Borders Police. 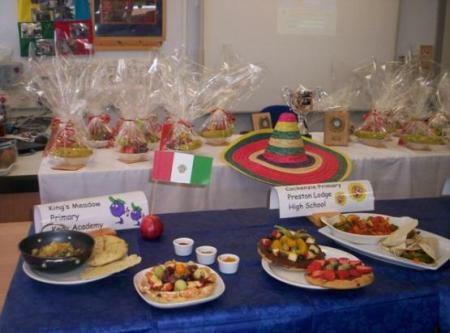 Now in its fourth year, The Little and Large Cookery Competition offers schools in East Lothian the opportunity to take part in a unique culinary challenge. The aim is to bring together primary and secondary pupils to experience the joy of cooking as well as to impart valuable life skills and raise awareness of the healthy eating messages in a fun, practical way. In the first round of the competition, two primary 6 pupils from each participating school are teamed up with a Home Economics student from their cluster High School. The role of the secondary student is to lead the activity by supporting and guiding the younger pupils through the processes involved in creating a healthy meal. The winning team from each heat then went on to represent their cluster in a county cook off which this year was held at Knox Academy on 27th May. 15 young chefs braved the heat of the kitchen to compete in the final. The teams were: Musselburgh Grammar with Whitecraig Primary; Preston Lodge High School with Cockenzie Primary; Ross High School with Saltoun and East Linton Primaries; and Knox Academy with King’s Meadow Primary. Their challenge was to create a delicious healthy two course meal using a wide range of ingredients which reflected international cuisine. Councillor Ruth Currie, Craig Hunter from The Avenue in Haddington and East Lothian Council’s Catering Officer Rick Cooper were on hand to judge the teams’ efforts before coming to their final decision. An S2 pupil from Knox Academy worked with two P6 pupils from King’s Meadow on their winning creations. They served up a tasty creamy Indian curry with cardamom-infused rice and a chocolate fruit pizza. All of the pupils in the final received a £10 book token to mark their achievements while the winners were presented with the Little and Large trophy and commemorative plaques to take back to their schools. What was good about this event? It encourages us to cook more. The girls had a fantastic time and were desperate to share their experiences with the rest of the class. Lots more children would have loved to take part. Finally, a big thanks to all those who took part this year and we look forward to seeing you in 2011! Welcome to the new Health & Well-being in East Lothian blog. This has been set up as a result of the first meeting of the Health & Well-being Steering Group to help coordinate and communicate the many Health & Well-being related activities taking place across the Authority. At the first meeting of the Steering Group we discussed the Current Situation and worked through a process to come up with an action plan. You can view the process below and click here to download the action plan. We’ve also added the list of current activities to the What’s Happening? page above – if we’ve forgotten anything please let us know.